This was originally published back in PC Gamer 305 in April 2017, and here it's presented online for the first time. Subscribe to the US and UK magazines for more features like this, designed beautifully for print and digital. Reading the reviews of Deus Ex: Mankind Divided, I noticed a trend. Almost every one of them, including my own, mentioned one level in particular: the Palisade Bank. This dense, complex map is arguably the highlight of the game, and a neat microcosm of everything I love about Deus Ex. It's an intricate web of security systems and shortcuts, with severe brutalist architecture and gleaming marble floors. And the first time I set foot in it, the urge to cause trouble and test the limits of the security was irresistible. The design of the Palisade Bank level was led by Clémence Maurer, who worked on it from the earliest concept to its completion. "It was always planned," she tells me. "We have a high-level story document called the blueprint, which details all the places the player will visit during the game and the most important branches of the story. And the idea of breaking into a highly secure data haven was a core part of the game from the early stages of development." The initial pitch was simple. Jensen has to break into VersaLife's vault and get something. They didn't know what yet. And that's all it took to fire Maurer's imagination. "I used some concept art depicting the exterior of the bank to inspire me," she says. "Then I started working with this shell, testing various gameplay spaces within it. It was still pretty organic at this stage, as I didn't know exactly how the space would function. Everything in Deus Ex must have a meaning and must feel plausible, so I couldn't just place random objects everywhere. The layout had to make sense." The first design was more conventional. The kind of big city bank you might have queued in yourself on occasion. "It had a front desk, offices, people waiting in lines, etc. But as the story developed and it became a corporate archive, I realised that it shouldn't be a bank where people go to withdraw money. It's a cold, elite, very secure place to keep top secret information, where the megacorps keep their most valuable data. Not something as trivial as money." The Palisade Bank is where the sinister corporations that rule Deus Ex's dystopian society keep some of their darkest, most precious secrets. There's no vault with a heavy circular door stuffed with gold bars, but thousands of sealed containers filled with data and things they don't want the world to see. Break into the vault belonging to Tarvos Security and you'll find experimental armour and computers tracking the company's enemies. "I started rethinking the space," says Maurer. "Where is the data locked away? Is there a vault, and what would it look like? Are there offices and people working there? How would the security systems work? Answering these questions was meticulous, demanding work, made even more difficult by the fact that this kind of building doesn't exist in real life." The vaults are stored in an immense vertical shaft, which players can sneak into with some effort. "The idea of a shaft containing movable vaults came pretty early. I wanted this to be the backbone of the layout, used as an alternate entrance and exit. It was originally more connected to the structure, at the very back of the lobby. You used to be able to see the shaft from the main lobby and vice versa. But now it's below the parking lot." After three months of work, the bank was starting to take shape. "The art direction was very clear," says Maurer. "This is not a bank where a lot of people work. It's so elite that very few clients visit, and most things are automated. That's why you don't see many people." When Jensen finally reaches VersaLife's vault, he finds himself in a vast chamber with containers stretching as far as the eye can see. "This was much harder to conceptualise," Maurer says. "We knew there would be a vista. We knew there would be big boxes full of corporate secrets, and that one would be brought to the player. Making this system come to life, and appear grounded and functional, was the toughest part of the bank's design for me." Some of her problems were external. "There was a lot of resistance to the idea of a shaft containing nested vaults. And as I presented the map to my superiors, they didn't really get it. So it was tremendously important that my design be bulletproof, allowing me to answer every question about how the space worked. It also had to provide engaging gameplay, meet the requirements of the story and art direction, and not blow the budget." If you get caught in there, the lockers will actually retract into the floor, leaving you exposed and making them inaccessible. The logic behind how the vaults worked was finally settled on, with help from Eidos Montreal's team of talented concept artists. There would be an immense archive room with thousands of vaults stuffed with corporate secrets. And when a client (or Jensen in this case) requests their vault, a crane plucks it from the stack and brings it over to them. Production on the bank proceeded quickly, and after six months the basic layout was set. "A few areas were a bit awkward and would need a lot of refining," says Maurer. "This was due to the fact that most people were working on the vertical slice of the game, which was of course a high priority task. Overall I worked on the bank for about two years, but I was also working on the Prague city hub at the same time." As well as being responsible for the grand vision of the Palisade Bank, Maurer also paid attention to the smallest details. "I'm a big believer in subtlety," she tells me. "I didn't want to just throw codes and key cards at the player. So that's why I spent a lot of time designing stories to give these items context. I also tried to convey useful information in a subtle way—like a clue to the manager's door code—so some players could find these things themselves rather than be handed them." I've always thought of Deus Ex levels as giant puzzles that you're given the tools to creatively solve, and I ask Maurer if that was the intention. "That's exactly what it's meant to feel like," she says. "We give you the tools, but not the answers. It's a tough, rich, and super dense map, and rewards smart and adventurous players who explore every corner of it. The pieces of the puzzle are not meant to be given away, but earned." 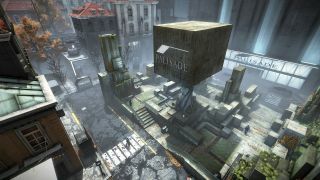 The bank was also designed to be one of the toughest levels in the game, and was in fact originally designed as a playground for the new remote hacking upgrade, at a time when it was forced on the player. "We eventually ditched that idea," says Maurer. "We never want to push augmentations on players. But it made sense that only a heavily augmented person could break into the bank using a combination of abilities. "It seems almost impossible when you first enter the bank. Especially if you aren't well equipped. I paid attention to how the challenge would evolve between your first visit by day to returning at night. I actually made it more difficult the first time you visit. This really makes you feel the power of the place, and rewards players who attempt to break in before they have to as part of the story. This also gives players who took the time to do this unprompted an edge later on, but they have to earn it." As well as the main vault, there are two chambers branching off from the lobby containing the executive lockers. I remember finding my way in here and feeling like a kid in a cyberpunk candy shop, merrily hacking every locker I could find and stealing the contents. Credits, ammo, Praxis points, biocells. I left with Jensen's pockets bulging and a sense of dubious satisfaction from robbing the place without alerting anyone. "I used the executive lockers to entice players back to the bank when they found a code or key card in Prague," says Maurer. "This would reward them with some nice loot, and some cool storytelling that would expand their knowledge of the universe. If you get caught in there, the lockers will actually retract into the floor, leaving you exposed and making them inaccessible." Although Adam Jensen is, in theory, one of the good guys, Deus Ex encourages thievery like no other game. In my save game I've cleaned out every accessible apartment in Prague, for no reason other than they were there. But Maurer is, of course, well aware of this, and makes allowances for players like me when designing her levels. "When I design levels, I always have those players in mind who will explore every inch of it," she says. "We support other player types, but I have a fondness for explorers." Eidos Montreal took on a considerable job when they decided to reboot Deus Ex, and they did it justice. But of all the places Adam Jensen visits, from Detroit to Prague, the bank sticks out as one of the best examples of the series' detailed, open-ended level design. When you've cleaned out every executive locker, office, and vault, and casually stroll out without raising so much as an eyebrow, the feeling of satisfaction is immense. I ask Maurer if she expected such a positive reaction. "I had my doubts at first," she says. "But I'm glad people liked it. I think people appreciate how challenging it is, and how rewarding it is to bypass this seemingly impossible security. All of this is contained within a pretty small map, but it's absolutely packed with content." Sadly, the Deus Ex series appears to be on hold as Eidos Montreal turns its attention to the Marvel universe. Who knows when it'll make a return, but the Palisade Bank is a hell of a parting gift.